Traditionally associated with Christmas trees, evergreens such as firs and conifers don’t have to only be present in the tree in your home. Lovely scented fir branches (whether bright green or more silvery varieties) can be displayed on mantle pieces or make beautiful table decorations. They can also be made into wreaths to decorate the home or on your front door – and don’t forget miniature Christmas trees which are a versatile decoration that can be placed anywhere in the house. Evergreen branches and sprigs can be bought from florists, garden centres and many high street shops – and lots of places that sell Christmas trees will also have winter foliage to purchase. A full-sized, real or artificial Christmas tree is a must for most households – creating a wonderful welcome for guests in the hall, or a magical decorative treat in the living room. But mini Christmas trees are also a great decoration for the season, and if you have a small flat these can be ideal alternatives to a traditional tree. Choose small potted evergreens in festive pots (such as metallic gold or seasonal red), or go for an alternative such as rosemary trees or orange trees for a different colour and delightful scent. There are plenty of artificial mini trees to choose from too – often fully decorated to make life easier. Display on the kitchen table, use as a centrepiece, add to a windowsill or perch on a coffee table for instant festive cheer! 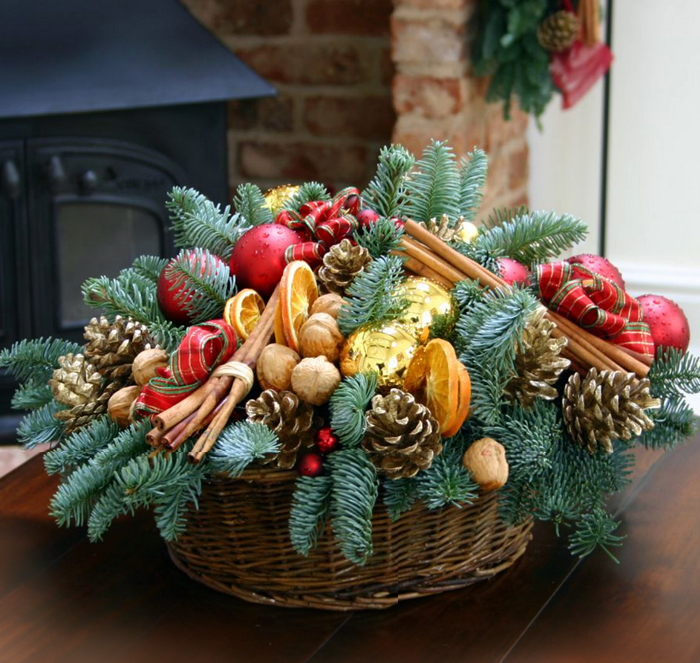 Arrange your evergreen branches down the centre of Christmas table for a colourful decoration. You could also add other foliage like olive leaves, eucalyptus or winter branches. Add fruits like clementines and lemons for colour and fragrances and natural elements berries and pine cones. And for the table lighting add white candles or wind fairy lights through your display. A sprig of fir, or of a herb such as rosemary of thyme, can also be tied to a napkin for a delightful place setting. 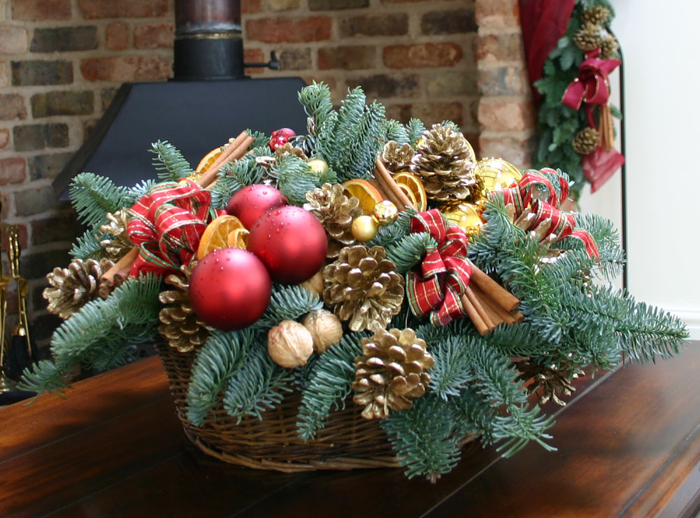 Winter greenery can also be added to Christmas flower arrangements, or added to bowls of pine cones and baubles to make a simple but striking table decoration. A Christmas wreath is a wonderful way to decorate your front door or indeed any door in your home. They can also be arranged above the mantelpiece or in the kitchen. Go for simple elegance with a circle of evergreens adorned with a bow, or choose and embellished wreath – adorned with baubles, metallic leaves, rustic berries and pine cones or fragrant cinnamon sticks and dried lemon and oranges. Head to the shops or florists to pick your perfect wreath, or get creative and make your own to ensure it’s exactly to your taste. Mini wreaths of evergreen can also be displayed in windows tied with lengths of ribbon for a more eclectic look, or used as table centrepieces. The days may be getting colder but what brings a warm glow to our hearts is knowing that the Christmas season isn’t too far away. The months of November, December and January are filled with social events like work parties, family gatherings and festive events with friends – and the likelihood is you’ll be organising one yourself. Decorations are key – and Christmas flowers are the perfect way to bring colour and vibrancy to a Christmas event. You can always turn to a trusted, creative florist for help creating beautiful Christmas flower arrangements for your event this winter. But it’s also helpful to have ideas in mind for how you want the event to look and the kind of floral displays you’re looking for. Roses are a classic flower that nonetheless has a versatility that makes it suitable for floral arrangements for all seasons. They create a sense of opulence and richness – perfect for special events this Christmas season. 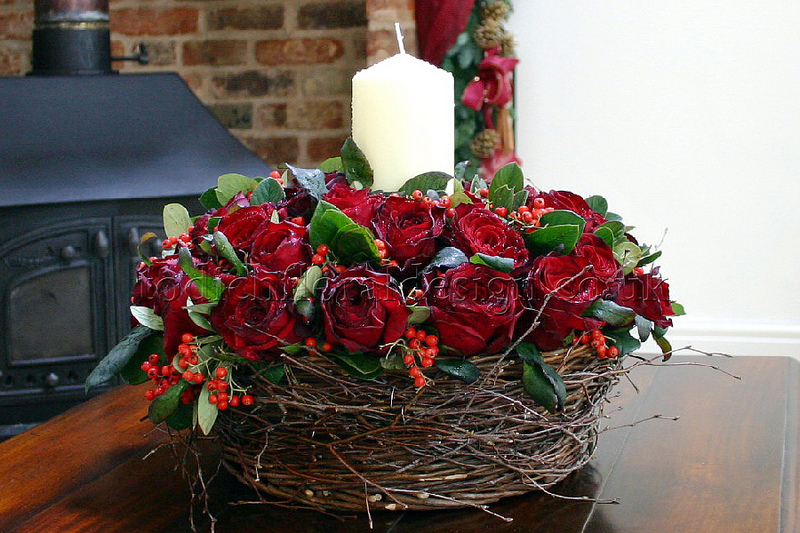 Red roses are beautiful juxtaposed with winter greenery like pine, ivy and fragrant herbs. A full bouquet of red roses will make stunning centrepieces on tables for corporate or casual events, while a single rose dotted on tables makes for beautiful additions to the occasion. 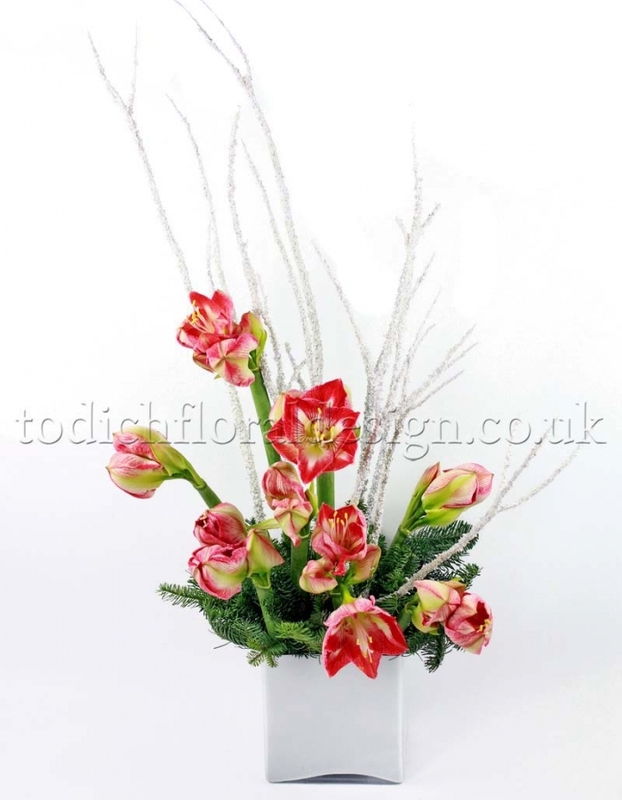 Red, white and green being traditional Christmas colours, white roses also present a great option for event flowers. Create winter wonderland displays with white roses and silver or gold adornments like painted branches, baubles and fairy lights. The Christmas tricolore is inspired by the colours of the season: red berries, Santa’s suit and Rudolph’s nose; white snow and doves; evergreen trees and holly. Incorporating these colours into Christmas flower displays will create beautiful, classic displays for guests at any event. Greet guests with a red and white amaryllis arrangement featuring silvery branches, or choose elegant lilies and berries with red baubles – a lovely table centrepiece or addition to restaurant and hotel receptions. A Christmas wreath of pine is a perfect addition to Christmas parties – decorated with gold and silver decorations, red berries and white flowers. During this sparse time of year, English flowers are far and few between so we take inspiration for warmer climes for flowers to bring colour and joy to Christmas events. Colourful anthuriums teamed with silvery branches make for perfect Christmas event flowers – whether as centrepieces or at the reception area. Tropical flowers like ginger flowers, birds of paradise and anthuriums are all available in the rich colours of the season – red, orange and gold – and make perfect, striking event flowers for your winter parties. And never underestimate the addition of a Christmas tree to make an occasion really special. Displayed in the entrance hall or main room of your event – even if it’s an outdoor do – a sumptuously decorated Christmas tree brings instant feelings of warmth and joy. 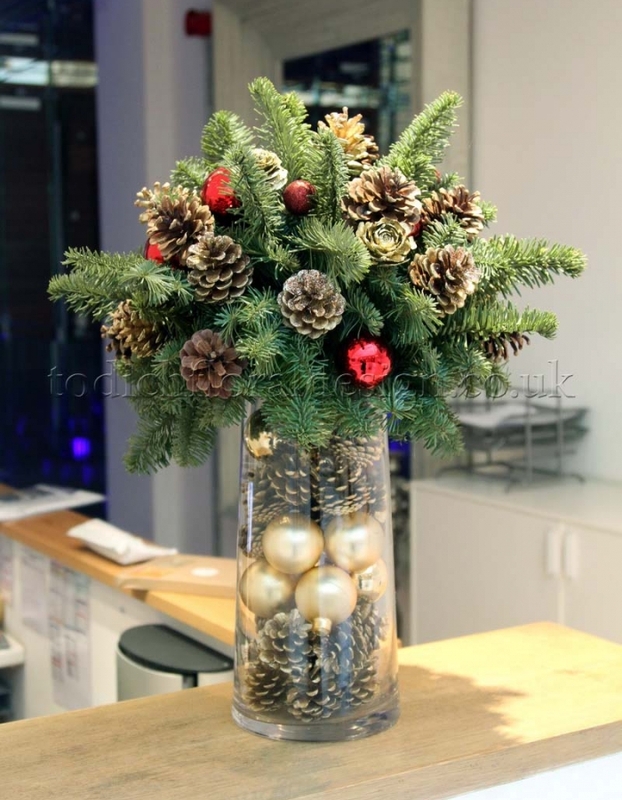 Your London florist can help create the perfect stylish tree to suit the occasion and make your Christmas event truly special.